Brexit and Donald Trump aside, the physical and mental health of our population is among the most common topics focused on by the media today. Increasingly, the headlines are dominated by the debate on sugar. The problem that we find with many of these headlines, however, is that – for whatever reason – they can be frustratingly misleading. We certainly can’t help on the Donald Trump or Brexit topics, but we like to think we know a thing or two about nutrition (we are science and nutrition geeks, after all). 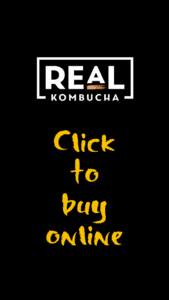 Here at Real Kombucha we are all about making better food and drink decisions more often. In fact, that ethos had a lot to do with the formation of our company: we wanted to create a healthy drink, low in sugar and all the other gloopy stuff, that also tasted great. 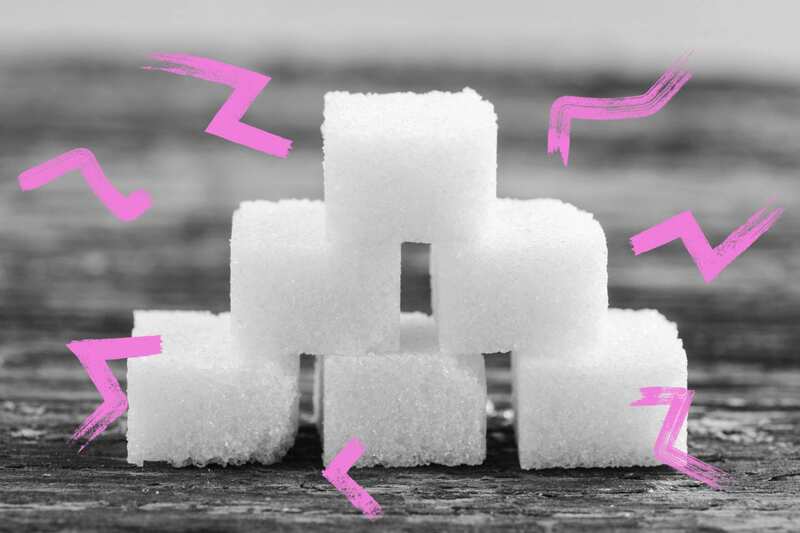 Since we’re not in the habit of keeping useful bits of information to ourselves, we thought we’d shed some light on how much sugar you should have daily, and then line that up alongside the amount of sugar you’ll find in certain food and drink products. Pry your fingers away from your eyes and take it all in. If you’ve ever asked the question ‘what can I drink that has no sugar?’, well we might just have the answer for you. First off, what exactly is sugar? Sugar is the most basic form of carbohydrate, and its forms include glucose, fructose and galactose. These are sugars that are found in lots of different foods. Glucose is found in rice, potatoes and bread, where it is bound up into long chains known as starch (a carbohydrate). Fructose is fruit sugar and can be found (surprise, surprise) in fruit. Galactose, on the other hand, is the sugar you’ll find in milk. All of that said, when sugar is mentioned most people are referring to table sugar (known as sucrose in the science world). Whichever form of sugar you’re referring to, it’s clear that it can be found in lots of the foods in our diet. In many situations it is accompanied by other really good nutrients – a banana, for instance, contains glucose (geek fact: a yellow banana contains more glucose than a green one) but also fibre, B vitamins, potassium, and other trace minerals. The same applies to milk: galactose and lactose are combined with some healthy fats, protein, B vitamins, calcium and vitamin D. Bananas and milk aren’t exactly high on the list of foods you’d consider bad for you, so where does that leave us when it comes to the perceived evils of sugar? It seems that when sugar – specifically glucose and fructose – are removed from foods and offered up in isolation, bad things can start happening. Very high on the ‘Bad Things List’ are sugars that have found their way into the sugar-sweetened beverages that most of us guzzle when we’re out and about. In short, sugars found in places that nature intended them to be are generally found alongside other good nutrients and can be considered friendly. Sugars that have been melted into a liquid and pressurized in a can? Not so much. Is there anything good about sugar? Before we look at the bad things about sugar, it’s important to know that it can be a force for good. It’s the predominant energy source in our body, and we are actually very good at storing sugar in the form of glucose (we can store about 2,000-2,500 calories worth of glucose). We store it in our brain, muscles and liver, where it forms a store of energy. Geek fact: the amount of glucose you store in your body is enough fuel to run a half marathon before getting tired. Whether you’re Mo Farrah or the most sedentary office worker in the land, that’s quite a bit of energy. Think of it as a tank of petrol which can be used whenever you need it. This inbuilt petrol stand is a little bit of evolutionary magic, stemming from our hunter gather days when we needed excess fuel to sprint after our food or away from predators. No longer needing to chase our food or escape kill-happy neighbours, the tank of petrol tends to just sit there. Eventually it drains away, and when this happens we experience fatigue, a loss of concentration, and we retain less information in our brains. So, without sugar (glucose) in our bodies, we would be pretty useless at most things that healthy, happy and successful human beings tend to do. Elsewhere, sugar is also important to our taste, not to mention our sense of wellbeing. There are receptors in our mouths that link sugar and sweet tastes with enjoyment and happiness. That’s why a piece of cake can leave you feeling very pleased with yourself indeed. Note the words ‘a piece’. Not ‘two pieces’ – just ‘a piece’. The big thing to remember is that we do not need to over consume sugar. Yes, it does some good stuff, but we don’t need a huge amount in our diet. You don’t need me to tell you that we over-consume sugar, however, and we have been doing so for sometime. Just as you wouldn’t keep ramming extra petrol into your car when you know it is full, it’s a little bit nuts to keep forcing your internal engine to take more sugar. We have been overfilling our bodies with this stuff for a little too long, and it is having implications on our health. So, why is sugar bad for me? Over-consumption of sugar in our diet has been linked to the rise in obesity, as we are consuming more of it in the readily available food and drink that lines the shelves around us. Sugar-rich products do not fill us up, meaning we end up consuming more food throughout the day. However, the over-consumption of calories from sugar is only one part of the problem. Too much sugar in our diet, especially if we are not moving and exercising, means our body gets worse at dealing with sugar. The hormone that stores and clears sugar from our body (insulin) gets worse at its job (which can lead to type-2 diabetes). The bad thing here is that when insulin becomes lazy, so do other organs in our body. Sugar is converted to fat and we see a build up of fats in the wrong places, which in turn can mean our liver begins to deteriorate. That can then lead to cardiovascular disease, and before you know it you’re looking at a list of chronic illnesses that read like a medical encyclopaedia. As I pointed out earlier, the side effects of sugary products have been shown to play particular havoc when consumed in carbonated sugary soft drinks. A report from Public Health England showed that sugary sweetened drinks are closely linked with the increased risk of developing type-2 diabetes and gaining weight. Put simply, it highlights that high-sugar drinks should be limited in order to preserve our health. How much sugar am I allowed to have? The government recently changed the daily recommended intake for free sugars from 10% of your energy intake to 5% (free sugars are what we call the white stuff that has been added to your food rather than existing there already). So for an average man and woman, that means 31g and 25g respectively. That’s about 5-6 teaspoons of sugar per day. 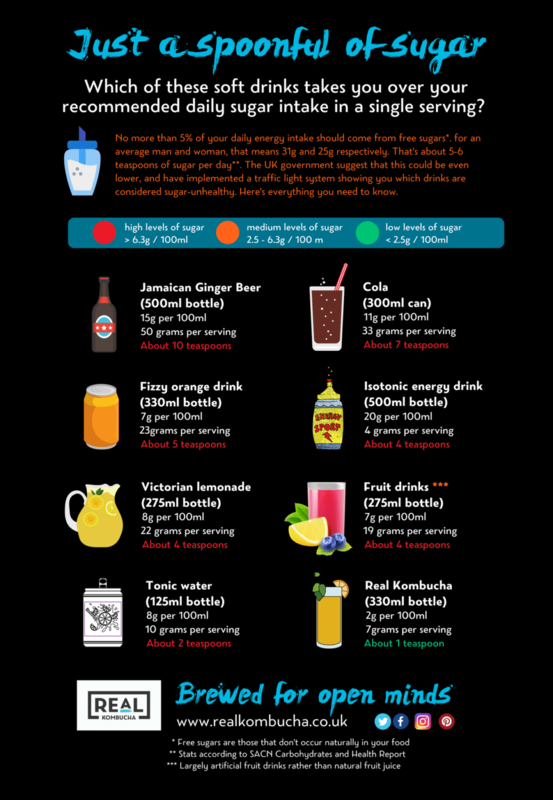 Check out the graphic below to see typical drinks in our diet that have us overdo our daily recommended sugar dose in a single serving. What can I do to cut down my sugar intake? Firstly, choose foods that are low in sugar. You should be aiming for foods that are less than 5g/ 100 g and drinks that are less than 2.5 g/ 100 ml. The Department for Health has introduced a traffic light system. The traffic light system allows you to select foods that are lower in sugar (green), moderate in sugar (amber) or high in sugar (red). The simple rule is drink and eat more foods and drinks that are green, less that are amber and avoid products that are red. You should also aim to eat and drink products that are whole foods or as close to nature as possible. This means that the sugar is either low in the first place or is in combination with other beneficial nutrients. What does all of this have to do with kombucha? For us at Real Kombucha, the lack of low-sugar drinks in pubs, bars, restaurants and cafes is what moved us to start trying to brew something a little bit more special. For the past two years we have perfected our recipe to create a complex and flavour-rich drink that is low in sugar (2 g sugar/ 100 ml). Want to know how we’ve done this? Then I suggested you grab a bottle of kombucha and set about reading this article here. If you’ve got any questions, you know where to find us.